The Office of the United States Trade Representative (USTR) published a list earlier this month of approximately $16 billion worth of imports from China that will be subject to a 25 percent additional tariff as part of the U.S. response to China’s unfair trade practices related to the forced transfer of American technology and intellectual property. This second tranche of additional tariffs under Section 301 follows the first tranche of tariffs on approximately $34 billion of imports from China, which went into effect on July 6. Customs and Border Protection will begin to collect the additional duties on Chinese imports on Thursday August 23, 2018. The second tranche (portion) of products can be accessed here. · China uses joint venture requirements, foreign investment restrictions, and administrative review and licensing processes to require or pressure technology transfer from U.S. companies. · China deprives U.S. companies of the ability to set market-based terms in licensing and other technology-related negotiations. · China directs and unfairly facilitates the systematic investment in, and acquisition of, U.S. companies and assets to generate large-scale technology transfer. · China conducts and supports cyber intrusions into U.S. commercial computer networks to gain unauthorized access to commercially valuable business information. A third list has been published and these may go into effect sometime in September. You can see the list of tariff numbers possibly impacted here. Please contact your Import Coordinator if you have any questions. 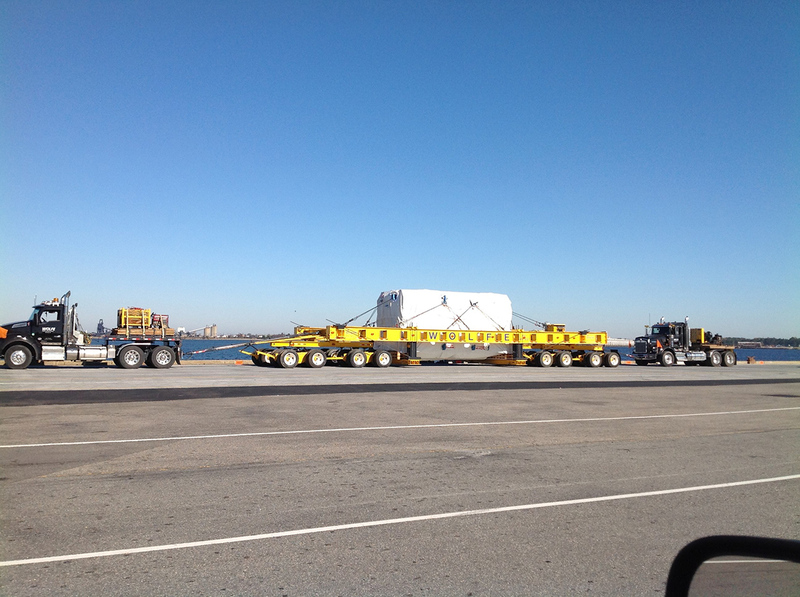 The video is of a shipment that Thunderbolt Global Logistics arranged from the Port of Portsmouth, VA to Union SC. It’s a lower bed of an industrial press. The gross weight was 113,000 kgs/249,120# and dimensions 8.20 x 3.95 x 3.96 meters/26’11” x 13’ x 13’ (LxWxH). We did this for the Project Cargo Division of Sparber Group in Barcelona, Spain. A special shore crane was hired used to lift on to the truck. Wolfe House Movers was excellent to work with and provided a high level of communication during the journey to Union. It could only move during daylight hours and required police escorts all the way to destination. The cargo arrived in perfect condition. 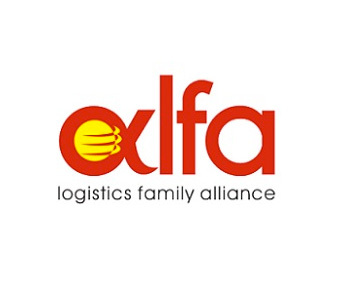 Thunderbolt Global Logistics was named ALFA Logistics Family Alliance Member of the Year for 2017 at their annual meeting held In Penang Malaysia in October 2017. Jim Shapiro attended the meeting and was presented the award by Luc Huysmans Founding Father of the ALFA Logistics Family Alliance. 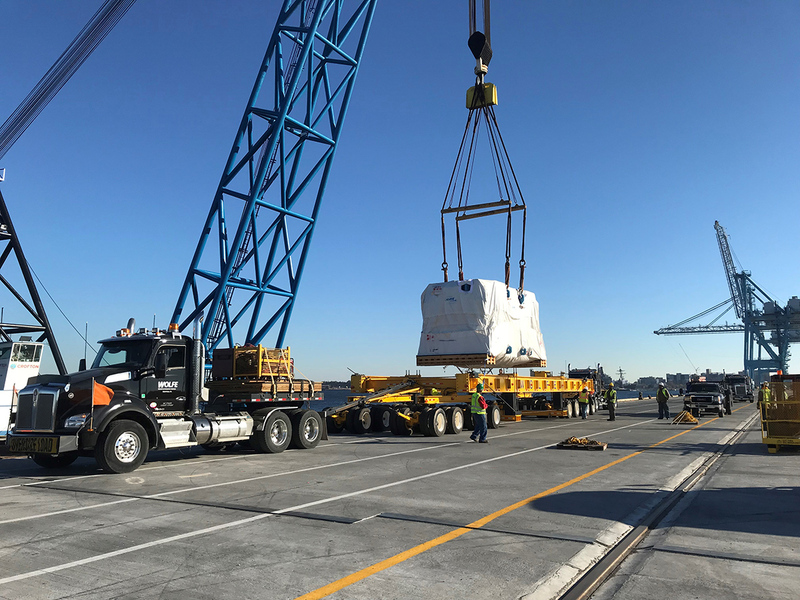 Two steel mill rolls weighing 15,783 kgs each arrived at The Port of Baltimore on a 40’ flat rack. 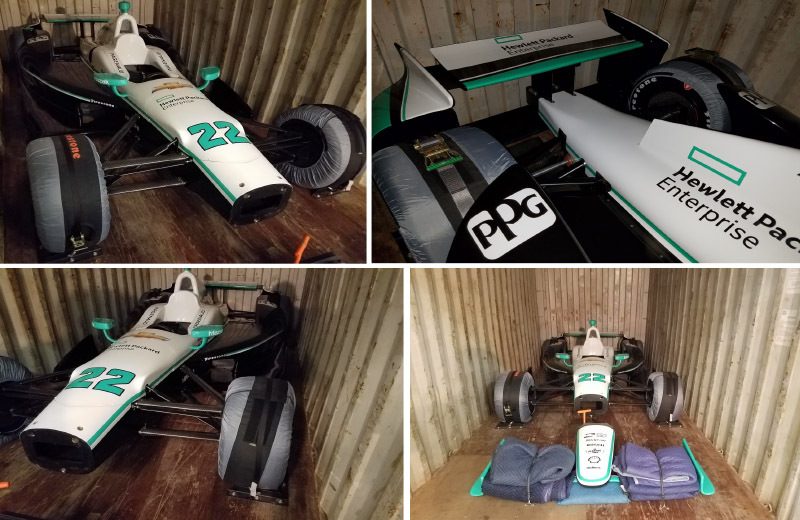 The Thunderbolt team arranged to have it picked up, all wrapping removed and loaded on 2 flat bed trucks fully tarped and delivered them to Mansfield, OH. 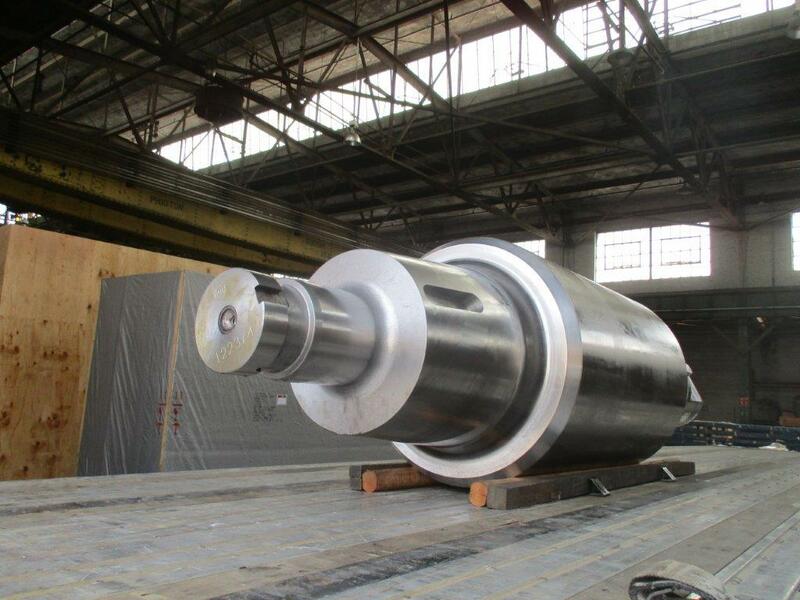 Thunderbolt Global routinely handles the transportation of steel mill rolls throughout the United States. This is business has grown for us and has become an area of specialization. 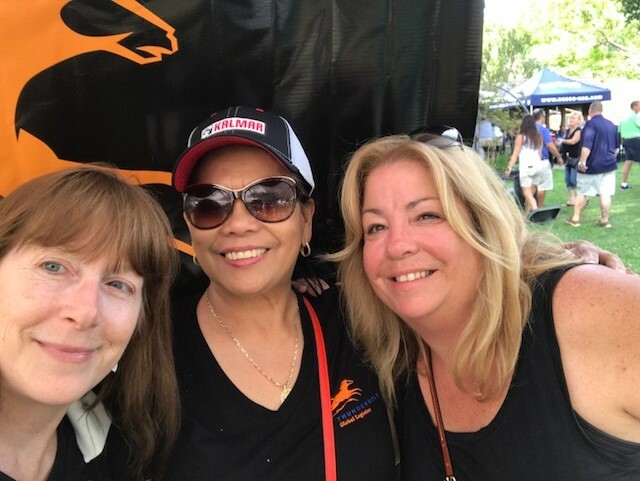 The Crab Feast is organized and run almost exclusively by volunteers – by Propeller Club members like Thunderbolt Global. 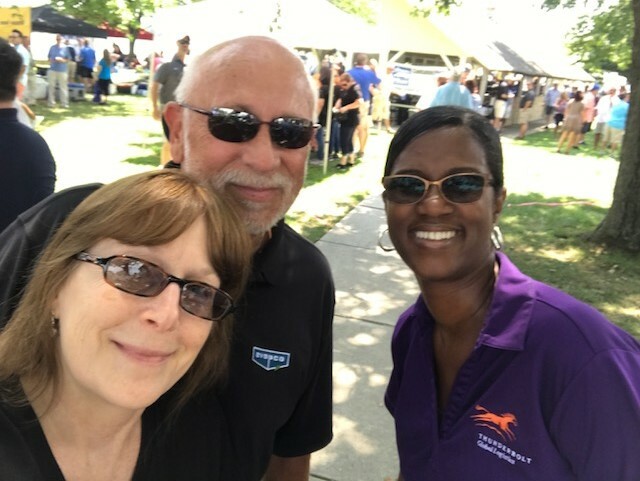 The Crab Feast is a fun event, great for networking in the Greater Baltimore community. 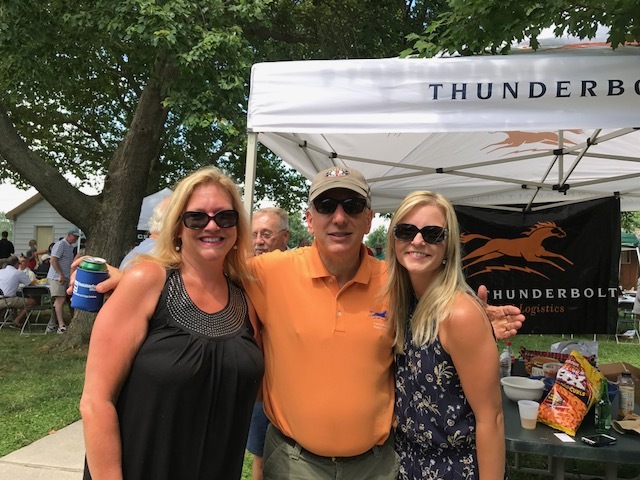 A good time was had by the Thunderbolt Global team. Jim Shapiro & Chris Osborne attended the CLC Project Network conference in Panama City, Panama in October. As part of the conference they visited the new Panama Canal locks in Colon that opened on June 26th that allow post Panamax size vessels to transit the canal. 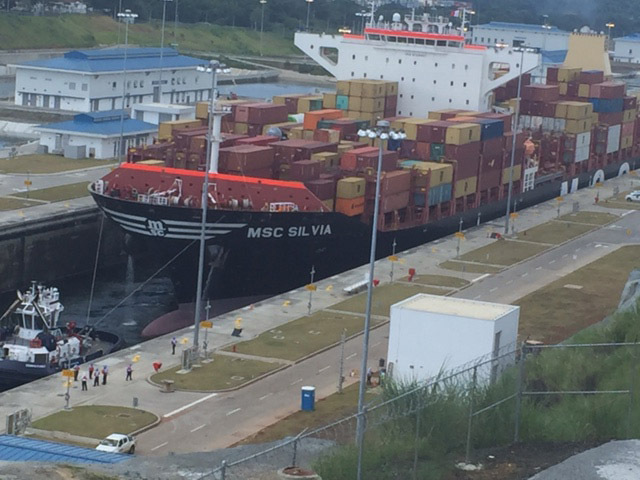 The photo shows the MSC Silvia transiting the Agua Clara locks in Colon coming from the Atlantic Side and heading toward the Pacific side Total time to go through the new locks shown is approximately 4 hours. Thunderbolt exported this Indy race car to the 2016 Paris Auto show under an ATA carnet. This was sent from Indianapolis to Le Havre, France. As with all Thunderbolt shipments of a sensitive nature, great care was taken by our team to ensure arrival in perfect condition. Images of the vehicle can be seen below. The car is currently being imported back to the U.S. and upon arrival will be sent back to Indianapolis. 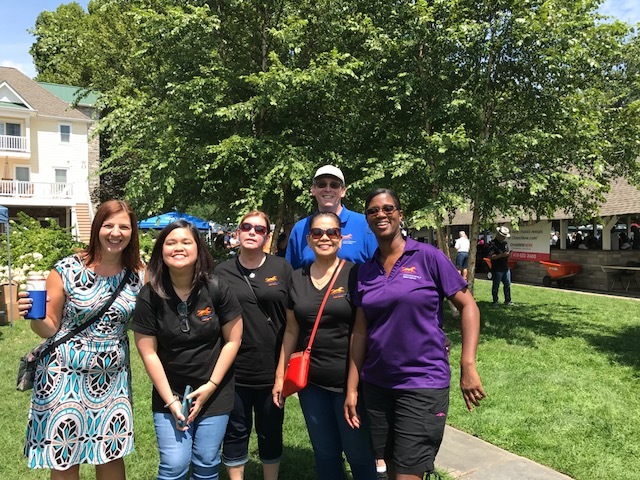 To learn more about our process of delivering excellence, call us at 410-633-2722, or email an inquiry using our contact form. Effective July 1st, 2016, a new regulation from SOLAS (Safety of Life at Sea) takes effect requiring shippers whose name appears on the bill of lading to verify the gross mass (VGM) of a container carrying cargo. This declaration (see attached) must be received before in gating the container or containers. Such declaration must be submitted to the carrier via web portal, EDI, or manual submission prior to the VGM cut off, with the electronic submission widely regarded as the most efficient. VGM cutoff times will vary by port & carrier. Many carriers have advised they will apply a “no VGM, no load” policy from July 1st, 2016. Submission of VGM can be done by the shipper or freight forwarder. 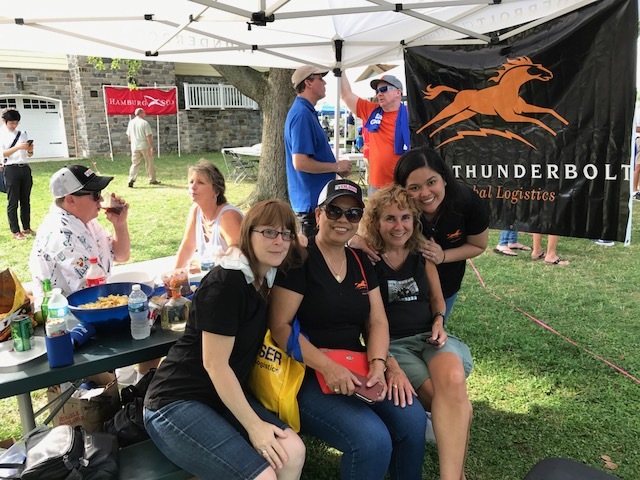 Thunderbolt can submit on your behalf, however we would require the completion of the attached VGM declaration once the cargo loading process has been completed. Applicable fees may be associated with this submission. For further information regarding SOLAS guidelines & requirements refer to our May 24th, 2016 post below. What is SOLAS– IMO’s- International Convention for the Safety of Life at Sea (SOLAS) requires that every containers Gross Mass is verified(with a signature) prior to stowage aboard the ship/vessel. Who is Responsible– The shipper is responsible for the Verification of the Gross Mass of a container. They are also responsible for ensuring that the Verified Gross Mass is communicated in the shipping documents sufficiently in advance so it can be used in the ship’s stowage plan. Why SOLAS– To ensure the safety of the ship, the safety of workers both aboard ships and ashore, the safety of cargo and overall safety at sea. When– The new regulation is effective on July, 1 2016. Where– There are 171 International Maritime Organization (IMO) member countries and 3 associate members. Method 1: Upon the conclusion of packing & sealing the container, the shipper may weigh, or have arranged for a 3rd party to weigh the packed container. Method 2: The shipper/3rd party may weigh all packages and cargo items, including the mass of pallets, dunnage and other packing and securing material to be packed in the container and add the tare weight of the container. Select the best weighing method (1 or 2) to determine VGM (verified gross mass-which is the gross weight) for your business. Method 1- Shipper or a 3rd party may weigh the container after it is packed and sealed using certified equipment. Method 2- Weigh all packages and cargo items to include pallets, dunnage, securing material to be packed in the container plus the tare weight =VGM. 1) Check the weight marked on the container/door. 2) Contact Container Carriers Customer Service to verify container tare weight. VGM(whether arriving by road or rail), some port terminals will offer weighing services for a fee. Amounts will be dependent on the port/terminal. VGM cut off times will vary by port, terminal. We are working collectively with the various Ports, Truckers & Steamship lines for best practices. have any inquiries please do not hesitate to contact us. 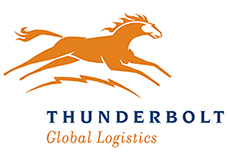 Stay tuned to the Thunderbolt Global website for more information about industry changes.